No matter how many times we hear that phrase, we still rush out in the morning with barely enough time to lock the door behind us. Still, in the back of our minds, we know that breakfast sets the tone for the rest of the day and the choices (healthy or not) we will make for lunch and for dinner. Just for the record, I LOVE oatmeal. I’ve loved oatmeal ever since I was a kid and Mommy would keep those boxes of instant oatmeal packets on hand for us to eat in the morning, and sometimes as an after school snack. I recently decided to give those instant packets a whirl again. Apparently my mature palate is much more sophisticated than it was when I was a kid because those packets were a sugary, watery letdown. Then I tried some of those healthy alternatives on the market. That wasn’t a letdown at all. Just as I suspected, they tasted like I was eating waterlogged cardboard. In desperation, I decided I needed to make my own. 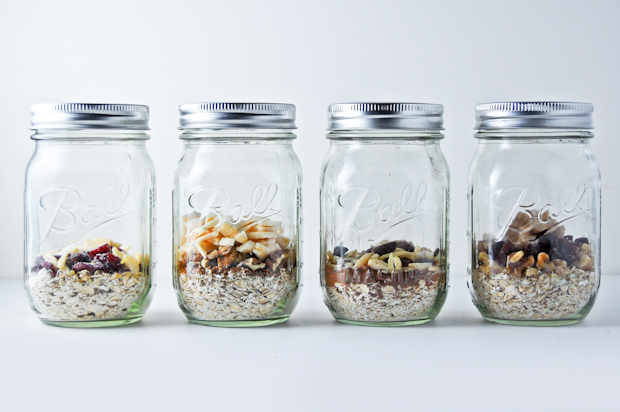 All you need to get started are some mason jars, some oatmeal, and your favorite oatmeal fixin’s. I use Bob’s Red Mill Quick Rolled Oats, partly because for some reason it always reminds me of that U2 song, but also because they cook instantly when you add boiling water. As for the fixin’s, I try to stick to dry ingredients that will last in the pantry like dried fruit and nuts. After some quick Pinterest research, I found some awesome recipes. I particularly love the ones I found on Amybites. There are tons of flavor combinations. Just follow the link below. How long does it take? Busy momma on the go! I literally make like 10 of these in less than 20 minutes. I’m a super lazy cook, so I try never to spend too much time prepping or cooking. When I’m ready to actually eat the oatmeal, I put on the electric kettle, boil the water, pour it in, and let it sit for maybe 2 minutes. These are seriously easy to make!